« It’s All Just a Lack of Oxygen to the Brain, Isn’t It? This is circulating on campus. I’ll be giving a private Earth Day talk myself on Sunday. In preparation for it I am going to drown a few small puppies using a swimming pool paid for with Exxon money. 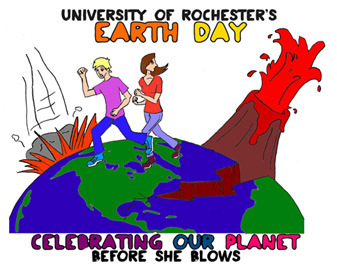 If you’d like to see what the U of R has planned for Earth Day, check it out here. For a glimpse behind the economics and environment of buying local, start here. I think it is lost on folks that the planet would actually blow if we took the “local” model seriously. Remember, ‘going green’ is not just for Earth Day. Green living should be a part of our everyday lives. We also are encouraging students and staff to join the Earth Day Network’s Billion Acts of Green, where people from around the world can sign up and pledge to change something in their lives, such as walking to the store rather than taking the car or turning off the light when one exits the room. This is the one thing I will miss least since graduating. The best part is the mountain of garbage they pile up outside Wilson Commons. They are right, I should eat my napkins, cups, and plastic forks. I’m starting to seriously consider that anyone who uses any variation of the word “sustainable” in regular conversation should immediately be regarded as a dullard. If I had the time, I would bring a box of Churchill Monte Cristos for us all to smoke at Rizzo’s pool party when we killed the puppies. On the menu would be Kosher National hot dogs, pulled pork barbecue, and, for the liberals, denatured ethanol. Did you work for Exxon? Or did you purchase the pool with bribe money?